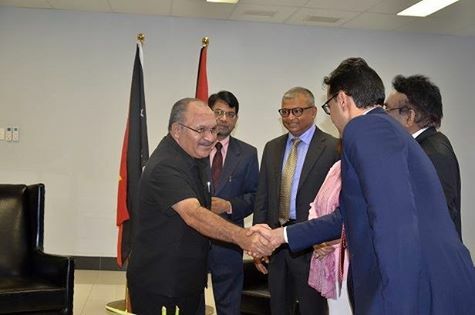 The Prime Minister,Peter O’Neill has welcomed a business delegation from the Confederation of Indian Investment (CII) that was undertaking its first ever exploratory visit for enhanced bilateral ties with Papua New Guinea. As India’s premier business organization, the CII has around 8,000 members from the private and public sectors, including SMEs and multi-national corporations. At the invitation of PM O’Neill, the group is exploring business opportunities in the areas of healthcare, tourism, petroleum and natural gas, handicrafts, textiles, agriculture, education, infrastructure, mining and mineral resources. “Now is the time to invest in Papua New Guinea,” the Prime Minister said. “With global pressures facing commodity exporters around the world, Papua New Guinea’s economic fundamentals are strong. “This visit by the Confederation of Indian Investments demonstrates the confidence the international business community has in our country. “We welcome business and investment from India and the impact this will have on employment and development. “The visit is also important as we prepare for the anticipated visit to Papua New Guinea by the President of India, His Excellency Pranab Mukherjee, that is proposed to take place in 2016. The Prime Minister said the trade flow between the two countries is not large at the moment but has been increasing steadily with the potential for further growth. “Our two countries can capitalize on existing synergies to enhance trade and investment relations between them. “Papua New Guinea can do business with India as we have the resources and India has the market which can be tapped into readily. “Papua New Guinea’s engagement with India in trade and investment has progressively increased since the opening of our High Commission in India in 2006’’, the Prime Minister said. India and Papua New Guinea continue to enjoy close and friendly relations since establishing formal diplomatic ties in 1976. The two countries also collaborate in other international forums including the summit of the Forum for India Pacific Islands Co-operation (FIPIC), where India is seeking to forge trade and economic relations with the Pacific. Prime Minister Peter O’Neill attended the meeting of the India Pacific Islands Co-operation Forum in India last year. The CII delegation and was led by the entity’s Head, Pacific International Cooperation desk, Ms Suhba Ranjab, and met with Prime Minister O’Neill on 15 February 2016.